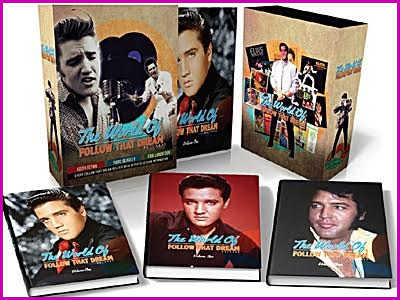 The new deluxe book 'The World Of FTD' is heading out to Elvis dealers today. Publisher Erik Lorentzen apologised to fans saying, "We are all sorry for the delay, but it's nothing we could have done to get it to you before. The printer runs 24 hours a day and they have all tried their very best. Thanks for your patience." The book was authored and designed by Keith Flynn with input from a large number of other Elvis specialists including EIN's Piers Beagley, EM&HM's Trevor Cajiao, Geoffrey McDonnell, Gordon Minto and many others. It is 1,200 pages, hardbound three book set, chronicling every release by FTD.The book also features 100s of high-quality photos from the collection Erik Lorentzen KJ Consulting are proud to publish this Box Set which weighs 8 kilos. I'd have hoped lessons would have been learned regarding the cheap, flimsy cardboard case the last triple set of books came in. Unfortunately not. The fools that designed this and the last one think it's ok to charge £150+ and then package them in what looks like a cereal box. This is very easily damaged - as mine is. I ordered mine. Just love the books like Files from Lorentzen & co. So what is your point now "you don't know me" ?? ?